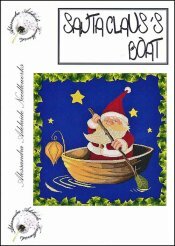 Santa Claus's Boat [C6840] - $17.10 : Yarn Tree, Your wholesale source for cross stitch supplies. Cross stitch pattern by Alessandra Adelaide Needleworks. Santa is enjoying a beautiful evening out on the boat. The stars are shining brightly in the midnight sky. Santa has a lantern in the front of his boat, guiding the way. Using a tree branch & a leaf, Santa got creative for his paddle for his boat. Stitch count 258w x 251h.